Designed and manufactured by Axiom GB, a ten destination series PR (pop-up roller) sorter has been supplied, which has the capacity to process 6,000 orders weighing up to 15kgs an hour, an eightfold increase in throughput for Superdrug. Justin Saw is general manager integrated systems business development for Logistex; he was a member of the team which selected Axiom as a partner for the project. He explains, “As an independent integrator it is our job to source best in class products for each individual project. Axiom was invited by Logistex to tender for the Superdrug sorter alongside two other companies. “As part of a detailed tender evaluation process, every response is scored against a set criteria. Each evaluation also considers Logistex’s confidence that the supplier can deliver on time and in budget. We also assess the level of risk with all sub-contractors as it is vital that we can achieve the performance criteria as defined in the contract. “For this particular project there was a wide range of different carton sizes as well as jiffy bags which required sortation. Axiom was selected because they have a proven ability in the sortation of both packets and parcels, and they understood our requirements really quickly. It also helped that we could take our customer, Superdrug, to an existing Axiom site to observe the equipment in operation. Superdrug’s e-commerce customers can select from a comprehensive collection of 16,000 products on the company’s website, ordering online for next day delivery. All of these orders are processed through the sortation facility. On the ground floor of the DC there are two main conveyor lines that feed the sorter. The first is a carton line where product is picked into cartons which are sent directly to the customer. The second line contains packet orders; these are merged onto the carton line with a degree of separation so that all of the orders can be fed into the sorter with a minimum 500mm gap. At this point Logistex’s LWS Reflex Warehouse Management System links with Axiom’s ACS software, sending data for each package to the sorter. 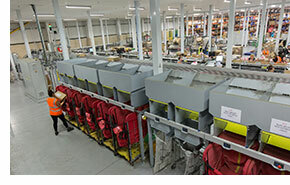 The orders travel up an incline conveyor onto the sorter where a final scan takes place. The packages are then directed into the appropriate despatch chute and a confirmation of destination response is sent to the Reflex WMS. Superdrug’s E-commerce general manager is Peter Appleyard, he comments, “Our online retail sales have been doubling year on year and it reached a stage where our current operation wasn’t capable of fulfilling the volume forecast for the next five years. Therefore we needed new technology to support our future strategy. 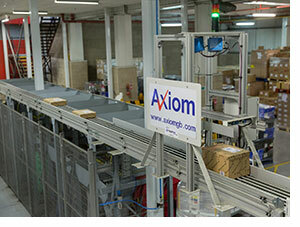 “The Axiom sorter is simple to use and gives good reliable performance. It has the capability to process 6,000 packets an hour, which is an eightfold increase in our throughput.